Midtown was once a mostly commercial and business district but in recent years has become home to trendy families as well as individuals who are downsizing from larger homes. New Midtown residents are drawn to the area’s many new high rise condominiums as well as dining and nightlife options, some of the best and most cosmopolitan in the city. Midtown is also a huge cultural draw as the area is home to the High Museum of Art, Woodruff Arts Center, The Fox Theatre and Piedmont Park. Efforts are currently underway to create The Midtown Mile along Peachtree Street, a stretch of retail shops that is intended to rival those along Michigan Avenue in Chicago. Piedmont Driving Club: The Piedmont Driving Club was founded in 1887 and is one of the most prestigious private clubs in the South. PDC, as it is referred to in Atlanta, provides outstanding athletic facilities to meet the desires of the membership for golf, tennis, swimming, squash, and fitness activities. Ansley Golf Club: Ansley is another one of Atlanta’s first class private clubs. Founded in 1912, Ansley’s amenities include 27 holes of great golf, tennis courts, fine and casual dining, and state of the art exercise facilities. Woodruff Art Center along with the High Museum of Art: These two icons truly are the heart and soul of Atlanta’s art culture. The Woodruff Art Center is the home of stunning performing and visual arts while the High features exhibits from some of the best artists in the world. The Margaret Mitchell House: Built in 1899, the Margaret Mitchell House offers tours of the home of Atlanta’s most famous author. The sight where Gone With the Wind was written is now one of Atlanta’s most loved and visited historical landmarks. The Fox Theatre: The Fox was built in the late 1920’s, and is an Atlanta landmark. It was originally built as the Yaarab Temple Shrine Mosque, (and still holds that style of architecture today) but because of large construction costs the Shriners were forced to accept additional funding from movie mogul William Fox, thus losing out on the naming rights. While it changed ownership several times throughout the great depression, the Fox survived and emerged as the most famous movie house in Atlanta between the 1940s and 1960s. Today, the nationally acclaimed theatre hosts a plethora of Broadway shows including Les Miserables, The Rockettes, The Westside story, and The Phantom of the Opera. 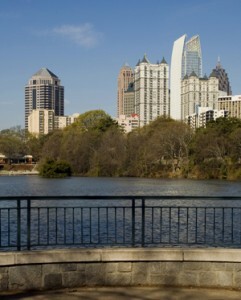 Piedmont Park: Piedmont Park is Atlanta’s most famous common space. Dating back to 1887, Piedmont Park is not only one of the most beautiful places in Atlanta, but also one of the most versatile areas that is home to various fairs, festivals, biking and walking trails and entertainment options. Atlantic Station: Atlantic Station is Midtown Atlanta’s best shopping center. Completed in 2005 on the site of the old Atlantic Steele Mill, Atlantic Station is home to Ikea, a state-of-theart movie theatre, and countless other high end shops and restaurants. It is a popular weekend destination for not only native Atlantans but also residents throughout the state.